On Wednesday, November 7 join Jack Granatstein (for) and Jeffrey Simpson (against) as they argue their positions. 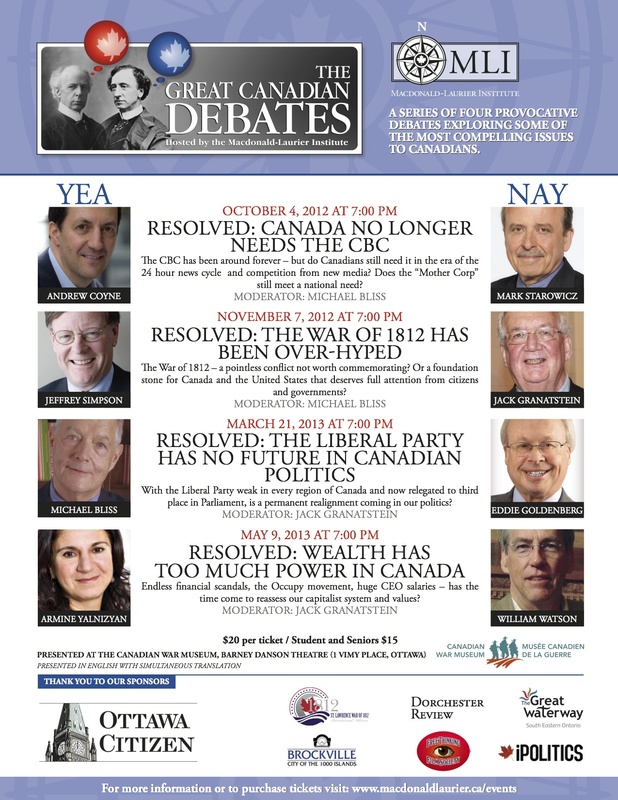 As part of the evening, the War Museum is opening up its War of 1812 exhibit to debate attendees. Tickets cost $20 each ($15 for students and seniors). Do you think the War of 1812 Bicentennial deserves commemorating? While Canadians commemorate the War of 1812 Bicentennial, detractors question whether we should be marking the conflict at all – especially given the amount of public funding that has been given to support the anniversary. Supporters, however, see the economic benefits major events, such as the anniversary of the Battle of Crysler's Farm, have on regions like the St. Lawrence. For one special evening, the Macdonald-Laurier Institute in Ottawa will bring opposing sides together to debate the commemoration. On Wednesday, November 7 join Jack Granatstein (for) and Jeffrey Simpson (against) as they argue their positions. Jeffrey Simpson is The Globe and Mail’s national affairs columnist and winner of all three of Canada’s leading literary prizes. Canadian historian, Jack Granatstein, is the former director of the Canadian War Museum. 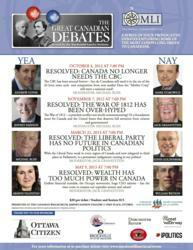 Michael Bliss, a Canadian historian, award-winning author and member of the Order of Canada, will moderate the debate. As part of the evening, the War Museum is opening up its War of 1812 exhibit to debate attendees. Tickets cost $20 each ($15 for students and seniors). Register online. Audience members will have the opportunity to challenge the views expressed by the speakers in a Q & A session. Following the debate guests are invited to continue the conversation at a private reception with complimentary non-alcoholic beverages and a cash bar.